Posted January 18, 2018 by Jamie Apps & filed under Arts & Entertainment, Movies. A romantic science fiction fairy tale set inside a secret government research facility during the height of the Cold War. This may initially sound like a strange combination but thanks to the phenomenal, almost entirely silent, performance by Sally Hawkins and great direction by Guillermo del Torro it actually works. Hawkins play Elisa Esposito, a night shift cleaner at the government facility, who happens to be assigned to a particular section housing ‘the asset’, a creature of unknown species or origin. Inexplicably Elisa is drawn to the creature and through the assistance of music, eggs and sign language they develop a bond. Michael Shannon plays Strickland, a government agent assigned to the task of discovering how ‘the asset’ can help the US win the space race. As the prototypical fairy tale monster Strickland is menacing, cerebral and violent as he embodies almost all of the racist, misogynistic and prejudicial elements of the 1960s. 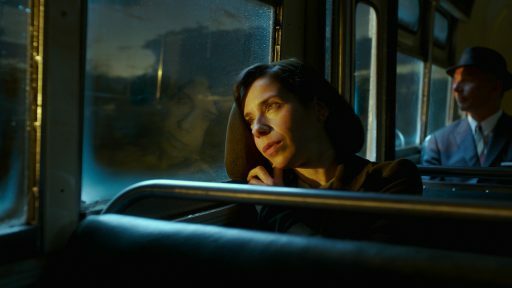 Whilst The Shape Of Water tells a compelling tale it is unfortunately all rather predictable and telegraphed which hampers the lasting impact it will have on viewers.